Mall of America (also MOA, MoA, or the Megamall) is a shopping mall located in the Twin Cities suburb of Bloomington, Minnesota. The mall became the largest shopping mall in total area in the United States when it opened in 1992; however, the mall has never been the largest in the world. 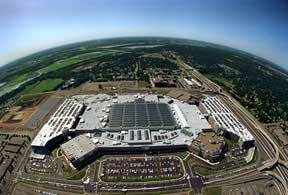 Mall of America is, however, the most visited shopping mall in the world with more than 40 million visitors annually .